Reptile Discovery Center staff at the Smithsonian’s National Zoo are mourning the loss of Alex, an elderly male Aldabra tortoise who was humanely euthanized Aug. 7. At the time of his death, animal care staff estimated Alex to be about 100 years old. The median life expectancy for Aldabra tortoises is between 100 and 150 years old. In early July, Reptile Discovery Center keepers noticed that Alex’s behavior had changed; he was sleeping more, lethargic and did not show an interest in food or training. Over the course of several weeks, keepers and veterinarians continued to monitor Alex closely, performing weekly checkups and administering antibiotics and anti-inflammatories. The afternoon of Aug. 7, Zoo veterinarians performed a diagnostic exam and discovered that Alex had a large volume of fluid inside of his shell and around his organs, including his heart. They attempted to improve Alex’s status by removing the fluid and providing additional supportive care. Despite staff’s robust efforts to improve the tortoise’s condition, his condition continued to deteriorate. Due to Alex’s poor prognosis and quality of life, animal care staff made the decision to euthanize him. A final pathology report will provide more information in the coming weeks. Alex was one of the oldest animals at the Zoo. He arrived at the Zoo’s Reptile Discovery Center in 1956 as an adult from the wild; at that time, keepers estimated that he was about 30 years old. For 62 years, Alex served as an ambassador for his species. Generations of Zoo visitors, keepers and scientists have been able to learn about Aldabra tortoise socialization, behavior and biology because of their encounters with him. Keepers fondly remember Alex as a social and personable tortoise who enthusiastically participated in training sessions and enjoyed relaxing in a cool and often muddy section of the outdoor yard. Keepers say he was a visitor favorite during the daily demonstrations at the Reptile Discovery Center and seemed to enjoy interacting with the keepers and Friends of the National Zoo volunteers who cared for him. Native to Aldabra Island in the Indian Ocean, Aldabra tortoises are considered “vulnerable” by the International Union for Conservation of Nature. Aldabras are one of the world’s largest land tortoises, and they inhabit scrub lands, mangrove swamps and coastal dunes. Males are considerably larger than females and can weigh up to 550 pounds. The male’s upper shell, called a carapace, can measure 4 feet in length. 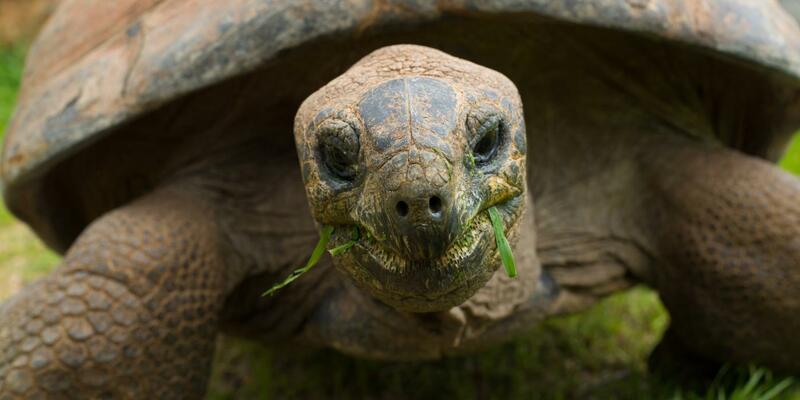 Aldabra tortoises are important to the ecology of the Aldabra atoll, eating nutritious fruits and leaves from small trees and shrubs and passing seeds through their digestive tracts; these seeds eventually become food for many other species. Zoo visitors can see two adult Aldabra tortoises, male Rulon and female Chyna, on exhibit at the Reptile Discovery Center.